Be the first to share your favorite memory, photo or story of Colette. This memorial page is dedicated for family, friends and future generations to celebrate the life of their loved one. 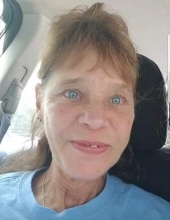 Mrs. Colette Ann Drennen Morak, 61, of Coats died Friday, September 7, 2018 at her home. Colette was born February 1, 1957 in Buffalo, New York daughter of the late Francis Joseph and Mary Ann Fettik Drennen. She was also preceded in death by her nephew, Alan Clinch. Colette was a retired department manager at Wal-Mart in Smithfield. Colette is survived by her husband, Thomas James Morak; daughters, Julie Yost and husband Rob of Willow Spring, Tammy Faniglula of Selma; step-son, Travis Morak of New Bern; sisters, Colleen Rolewicz of Fitzgerald, Georgia, JoAnne Teska of Oneida, New York; brothers, Francis Drennen of Vernon, New York, Robert Drennen of Florida; grandchildren, Zachary Foster, Austin Smith, Dylan Foster, Jakob Sutton, Joshua Yost, Tavius Moore, Peyton Morak and Liana Morak. There will be a family and friends gathering at Julie and Rob Yost’s house, Wednesday, September 12 from 2-7 p.m. 7204 Pekin Drive Willow Spring, NC 27592. To send flowers or a remembrance gift to the family of Colette Ann Drennen Morak, please visit our Tribute Store. "Email Address" would like to share the life celebration of Colette Ann Drennen Morak. Click on the "link" to go to share a favorite memory or leave a condolence message for the family.